How do you write about a movie when you barely understand it? Do you just not? 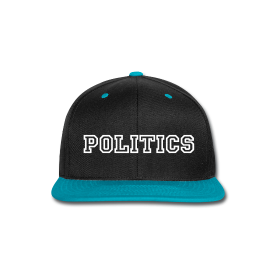 Do you wait for the smarter folks to swoop in and explain everything that you weren’t smart enough to glean? If you’re me, you give yourself a lengthy pep talk to remind you that your own opinions are valuable, and then you tell everyone about it at the beginning of your review. So what’s got me all rattled and meta at 11 p.m.? Well that would be The Congress, the most recent film by Ari Folman, the Oscar-nominated director of Waltz With Bashir. By the end of it all, years later, everyone is living out their lives euphorically in this augmented reality, perpetually doped up on the essences of other people and things, existing in whatever form they truly desire, without the boundaries of the physical world. To my mind, the plot gets a bit scattered. I had a number of questions—so many that I’m pretty sure it wasn’t just lazy viewing on my part. I won’t bore you with them all, but I will throw out a pretty significant one that I couldn’t seem to wrap my mind around: if the augmented reality is substance-induced, that is to say, just a change in perception, then wouldn’t each person’s vision and experiences be totally different from one another’s? When Robin’s sort-of love interest, Jon Hamm’s character Dylan, is explaining what the new New York City is like (really trippy and full of brightly-colored, high-profile pop culture figures, if you were wondering), how can it be possible that they are seeing the same thing? How can it even be possible that they are truly interacting? Are they not just in their own happy imaginations? This confusion could easily be a result of my own limited understanding of augmented reality, but I’m a fairly smart gal and I think the film was more afraid of admitting its confusion than I am. The animation itself is another conundrum. Stylistically, Folman’s previous film, Waltz With Bashir, bears very little resemblance to the animation in The Congress. I’d describe the cartoon segments as “Looney Toons on acid, but with fewer nuances.” Note that this isn’t as vicious as it sounds, because I’m fairly certain that the flat, gaudy madness was intentional—a form of visual symbolism for how hollow and unsatisfying humanity’s new version of reality truly is. There’s a lot of skewering going on, but it’s hard to gather what sort of statement Folman ultimately intends to make. Is Wright’s character the voice of reason, or are viewers intended to see that she’s just as flawed and misguided as everyone else? Does the film, for one reason or another, genuinely hate sci-fi, despite containing enough elements to be included in the genre? Are drugs the answer? Are drugs even the question? Admittedly, there are parts of the film that work very well. 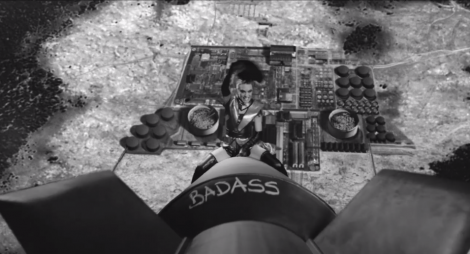 The clips of fake-Robin’s hilariously bad sci-fi action movie RRR (which stands for “Rebel Robot Robin”) are gold, and if I ever get a tattoo, there’s a good chance it will be of Rebel Robot Robin riding an atomic bomb with “badass” scrawled across it. (Dear self: this is why you should probably never get a tattoo.) And with the exception of the last twenty minutes, which ought to be parody but are in fact utterly genuine, the live-action sequences are spare and lovely, filmed with a haunting softness that brings out both the magic and the melancholy of Robin’s world. Which reminds me: I’d be remiss not to give serious credit to Robin Wright. (The real one.) (But what is real, really?) (I’m stopping now.) Any steadiness you’ll find in this film comes from her. The subtle facial expressions and body language of her cartoon self—seemingly designed to be the most grounded and human of all the animated characters—were the only consistently engaging animated elements, the bits that gave that segment its heart. At times when I was feeling particularly overwhelmed by the animation, I’d look away and just listen to her voice. It’s perfect. Throughout the film, transitioning between live-action scenes and voice acting, she is perfect—completely confident in who she is even while playing a broken-funhouse-mirror version of herself. I’ve taken the long way about it, not unlike the film, but basically what I have to say is that The Congress is pretty messy, and you ought not to watch it if you’re looking for a film with thematic consistency and a strong message. 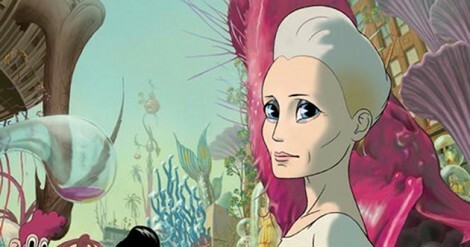 If, however, you’re looking for two hours of Robin Wright being lovely amidst a whole heap of sci-fi and cartoon wackness, well then you should probably hit it up. 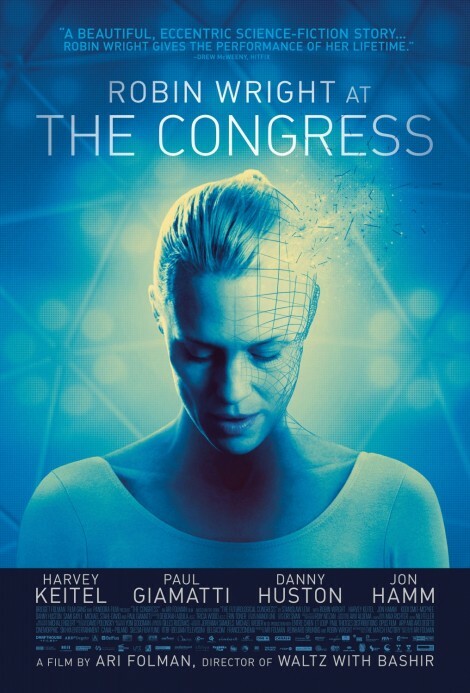 The Congress is out today and stars, you guess it, Robin Wright, along with a number of other actors that our writer was too exhausted to mention, such as Paul Giamatti and Harvey Keitel, who were all as good as they usually are. I just saw this movie and i paid attention and agree that the main character is the only reason i did not turn it off…she was that good. But I’m still trying to understand how they eat food or function. Why not each person build a bomb shelter stock it up then get on the La La train without worrying about ending up out side in filt. Why were people outside like zombies? Don’t get that at all.